Anyone interested in building a 1.e4 repertoire will find a slew of books on the market to support that enterprise. Those who prefer to open with 1.d4, however, will find many fewer single-volume guides (and certainly even fewer still in print). Perhaps the audience for repertoire books is just not interested in the positional lines that tend to follow 1.d4. In any event, there are some good ones out there. 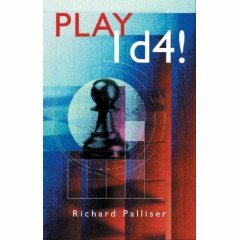 Here is a brief review of the 1.d4 repertoire books in my collection along with some of their selected games (care of Chessgames.com) so that you can get a feel for the lines they recommend. They are only eight, listed in reverse chronological order. I welcome additions by readers -- including, if you must, books devoted to a Blackmar-Diemer Gambit repertoire. 1) Starting Out: 1d4: A Reliable Repertoire for the Improving Player by John Cox (Everyman 2006), 240 pp. Very thoroughly reviewed by John Watson in TWIC #78. This is certainly the most current and useful 1.d4 repertoire book and a highly admirable effort. Cox sticks to main line theory, offering "improving" players a lifetime repertoire with 1.d4. The only downside of the book is that its recommendations are completely mainline GM-level theory that might indeed take a lifetime to learn, so an improving player is bound to get his head handed to him from time to time by stronger players more aware of the latest developments. But I think that's a small price to pay if someone really wants to improve and learn how to play the openings right. John Watson offers the most thorough discussion of the questions raised by recommending such high-level openings to beginners, and I tend to agree in the end with his assessment that only someone rated 2100 or above should attempt to adopt the whole repertoire, while improving players would do best to use it to pick up a few solid lines. I was especially impressed by Cox's treatment of the Albin Counter Gambit, where I think he makes the very best recommendation of 1.d4 d5 2.c4 e5 3.dxe5 d4 4.Nf3 Nc6 5.Nbd2! (the best way to pressure the d4 pawn, with the threat of Nb3) meeting my favorite 5...Nge7!? with the correct (but rarely played) 6.Nb3! Nf5 7.e4! += as discussed in my article on the Morozovich-Mengarini line. I also like its recommendations of the Bayonet Attack in the Classical KID, the main line Exchange Variation against the Gruenfeld (certainly White's best), the QGD Exchange Variation with Nge2, the Slav main lines (featured in Kramnik-Topalov), etc. All indisputably important and current stuff, if inevitably highly theoretical. Read Watson's review and ponder these questions with him: When should the improving player get immersed in current theory anyway? After he's spent his youth learning the intricacies of the Blackmar Diemer Gambit? Why not from the very beginning? But won't books like this inevitably turn him into a theory-head with too narrow a focus? I'm as torn as Watson is about these questions. But the book has clearly inspired a few worthy souls, since someone has already done the job of finding games for each chapter at Chessgames.com in one of their excellent game collections: Starting Out: 1.d4! 2) Play 1.d4! by Richard Palliser (Batsford 2003), 288 pp. Preview at Google Books. Reviewed by Randy Bauer and Carsten Hansen. This is another fairly serious repertoire, as you'd expect from Palliser. The lines are solid, positionally sound choices that strive for structural advantage whenever possible. The lines, while solid GM choices, are also a bit less main-line than those recommended by Cox, so they would make a good repertoire for a positionally-minded player unprepared to keep on top of all the latest theory. This book could also combine well with Cox's to create a more well-rounded set of choices. 3) Attacking with 1.d4 by Angus Dunnington (Everyman 2001), 160 pp. Reviewed by Carsten Hansen. This book is dense with information, has lots of lines that are not mainstream choices, and seems trying a bit too hard to be sharp and tactical at every turn (perhaps just to live up to the book's title). The lines are definitely sharp, though, and if you want to follow d4 with c4 yet seek a less positionally-minded repertoire, and one that leads to some interesting positions, then this is not a bad choice. The common thread seems to be a preference for lines with an early White f3 (even against the Nimzo-Indian) to stabilize the center in preparation for a wing attack. To me, this seems a little slow in the development department, and I'd much rather have Black in several lines. The lines are certainly double-edged and relatively unusual, but they just do not seem to fit together to form much of a system in my view. 4) Ideas Behind the Modern Chess Openings: Attacking with White by Gary Lane (Batsford 2002). Preview at Google Books. Reviewed at Chessville and by John Watson in TWIC #51. Lane presents a repertoire built around the London System with an early Bf4 for White. This is rightly considered an unchallenging White opening, but Lane manages to make the repertoire a little more interesting with specific selections that are fairly consistent with the London in their concern with dark squares. He recommends Bf4 against the Chigorin (1.d4 d5 2.Nf3 Nc6 3.Bf4), an early b4 advance against the Leningrad Dutch (1.d4 f5 2.Nf3 Nf6 3.g3 g6 4.Bg2 Bg7 5.O-O d6 6.b4!? ), Bg5 against the Pseudo-Benko, and includes the Barry Attack and 150 Attack repertoire covered by Aaron Summerscale. This book would make a fairly good supplement to Summerscale's for beginning players, and some may find this a solid if stolid choice. 5) Richter-Veresov System: The Chameleon Chess Repertoire by Eduard Gufeld and Oleg Stetsko (Thinkers' Press 1999/2000), 192 pp. I very much like the spirit and structure of this book, which presents the Richter-Veresov (generally beginning 1.d4 and 2.Nc3 for White) as a complex system of inter-connected transpositions, flowing freely between typical 1.d4 and 1.e4 lines. Hence the idea of "the chameleon" repertoire: the multiple transpositions allow White to camouflage his intentions so that Black cannot always predict the type of structure that will result. Rather than analyzing specific lines, Gufeld and Stetsko present a number of structures (e.g. : Benoni, Sicilian, French, Pirc, and Caro-Kann) and they analyze classic illustrative games, including many of Gufeld's own (typically on the Black side). The authors present a refreshingly balanced treatment of the opening that makes no claims for White's superiority. In fact, it's one of those rare White repertoire books where a significant portion of the games are drawn or won by Black. This emphasizes the point that Gufeld and Stetsko seek most of all to help the student of this opening system understand the principles and ideas of both sides so that he can find his own way through what continues to be relatively open territory with plenty of room for original play. The games themselves are all very rich and interesting, there is both analysis and historical treatment, and the breadth of the repertoire means that improving players will inevitably learn a great deal about a wide range of structures. I think this is therefore a valuable and worthwhile book, even if I have some doubts about the Richter-Veresov as a reliable long-term system. Those with a serious interest in these lines might also like to pick up Nigel Davies's The Veresov (Everyman 2003 -- game collection at Chessgames.com) and (if you can find it) Jimmy Adams's still useful Richter Veresov System (The Chess Player 1978), neither of which I list here because they are not strictly "repertoires." I have seen this book practically remaindered in various places, for cheap, so I recommend you snap it up if you like this sort of thing before the opportunity disappears. 6) A Killer Chess Opening Repertoire by Aaron Summerscale (Cadogan / Everyman 1998), 144 pp. Excellent review by Alex Baburin at ChessCafe. This is a lovely little red book with one of the most original and coherent White opening repertoires available in a single volume. British GM Summerscale presents a spectacular repertoire for a club player and everything you need to learn it, especially since he has also produced a number of video and DVD versions of the repertoire for Foxy (including on the Barry Attack, 150 Attack, and Colle-Zukertort), which would make it very easy to reinforce the lessons of the book for busy or developing players. If you want a solid repertoire that gives you very consistent ideas (around controlling the dark squares) and some surprising lines, this is the best book ever. My impression is that this book recently went out of print, so you better get your copy soon before the price goes sky high. Colle-Zukertort(1.d4 d5 2.Nf3 Nf6 3.e3 e6 4.Bd3 followed by b3 and Bb2) as in Zukertort - Blackburne, London 1883 and Yusupov - Short, Dortmund 1997. 7) An Opening Repertoire for White, by Raymond Keene and Byron Jacobs (new edition, Batsford / Henry Holt 1995), 144 pp. -- first published in 1984 and available in other editions. This is one of my favorite repertoire books, not only because of its very classical repertoire but because it chooses truly excellent classic games as its representatives. Almost every game is one you should probably know anyway because it's worthwhile in its own right. There is not a lot of deep analysis here, but that seems about right for club players or improving players seeking to learn a basic d-pawn repertoire while playing through some very good games. Overall, there may be no better way to get started playing a solid d4 repertoire than this classic book. Of course, it is currently out of print. But you should be able to find copies online. Nimzo-Indian, Deferred Saemisch as in Botvinnik-Capablanca (Avro 1938), Reshevsky-Fischer (Match 1961, Game 7), and Geller-Lisitsyn (USSR 1955). 8) Kasparov's Chess Openings by Otto Borik (Trafalgar Square Publishing 1989/1991), 128 pp. This is a very rare out of print book presenting great attacking lines for the serious student based on Kasparov's repertoire leading up to his first World Championship title, as both Black (Najdorf Sicilian and Classical King's Indian) and White (Exchange Variation QGD with Nge2 and Qc2 Nimzo for example). Very fine post, thanks! I have used the first edition of the Keene and Jacobs book since early in my career, though gradually spreading out to other choices until I only use a few of the lines these days; still, I've sure harvested a lot of points in the QGD and Slav Exchange right up to the present! I also have the Borik book on Kasparov, had no idea it was that rare--$103 Canadian on Amazon?! I'm very mildly tempted to sell mine at that number. But, no, I'd regret it later. Amazon currently has the Summerscale book listed at $581! Hardly worth it when you can buy all three Summerscale videos on the repertoire for less than $75. I think this is just some speculative book-seller recognizing that very few are currently on the market -- and that there is a real cult following for it. Personally, I think the Summerscale repertoire is great for a club player. Books like Keene's, though, offer you a much broader chess education. What about Berliner's "The System"?